Here are a few films from around the world featuring scenes where the good guys chasing the bad guys are doing so in high hood Jeeps. Which must be an advantage, right? 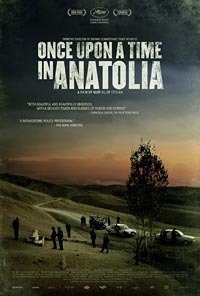 This 2011 film was a Grand Prize winner at Cannes, and a nominee for Best Foreign Language Film at the 2012 Oscars. 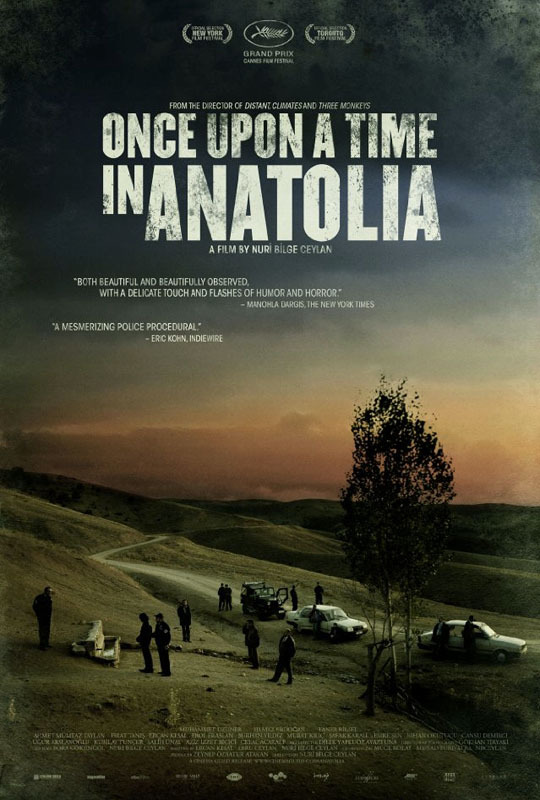 It's a slow, character-driven story about a group of cops and suspects on the road in the Anatolia region of Turkey, searching for a murder victim's body. 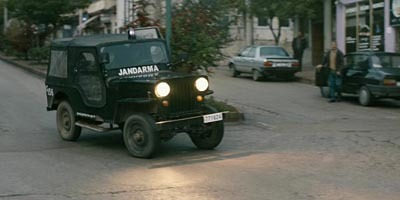 The long-wheelbase CJ-3B (likely Turkish-built) is lettered for the "Jandarma" or Turkish Gendarmerie, the military police force who patrol rural areas of the country and maintain national security. 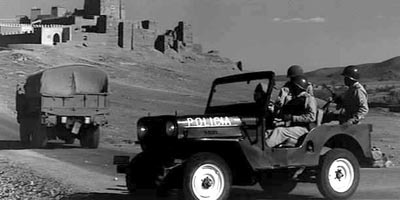 The Jeep spends much of the film tagging along behind, rather than chasing, a couple of unmarked Renaults (50K JPEG) as also seen on the poster above. 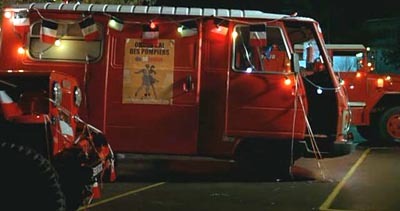 This rear view of the Jeep reveals later-CJ-5 style taillights, and the address of the Jandarma's website. 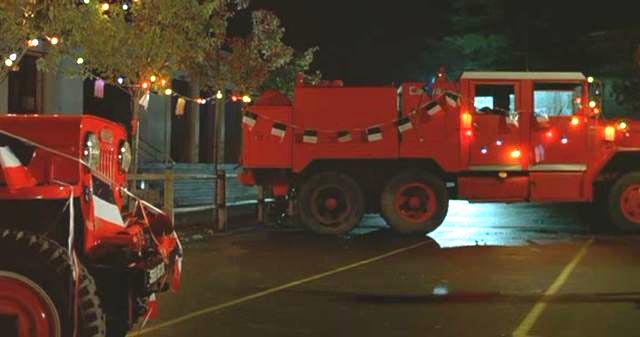 Thanks to Jay Valencia for spotting this Jeep, and to the IMCDB for photos. 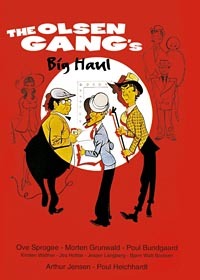 Big Score (also known in the UK as Big Haul , or in Denmark as Olsen-bandens store kup ) is one of the early films in a long and popular Danish series of Olsen Gang comedies. It's not considered one of the best in the series, but it has the usual coincidences, rival gangs of criminals, and suitcase full of money. 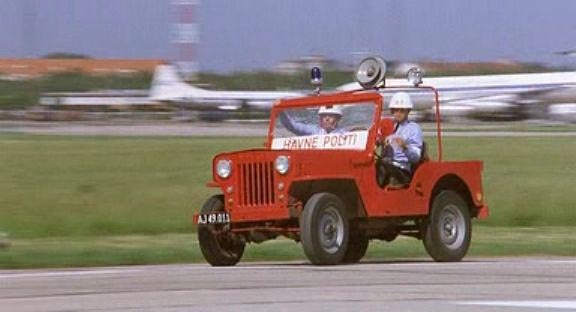 Much of the action takes place at the Copenhagen airport, where the police drive a CJ-3B. 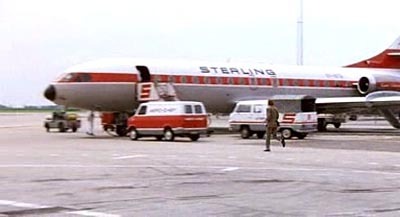 There are plenty of vintage jetliners in the airport scenes, and a glimpse of a vehicle here which may be another Jeep. 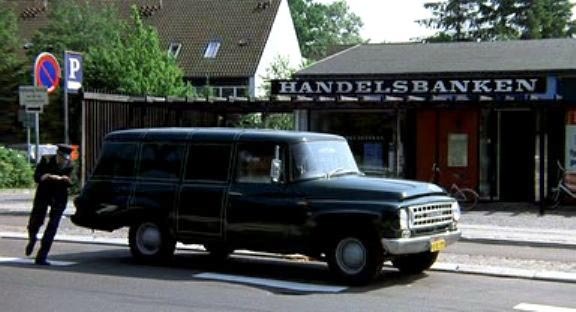 The gang's transportation for much of the film is a classic International Harvester panel truck (50K JPEG). One commentator on the Internet Movie Database calls this Tamil film made in India a romantic-comedy-action-drama-martial-arts musical. Which I think is a genre in India. 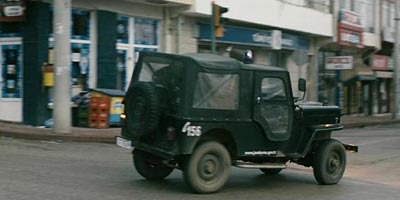 Anyway, it's great to see the police raising dust in a Mahindra. 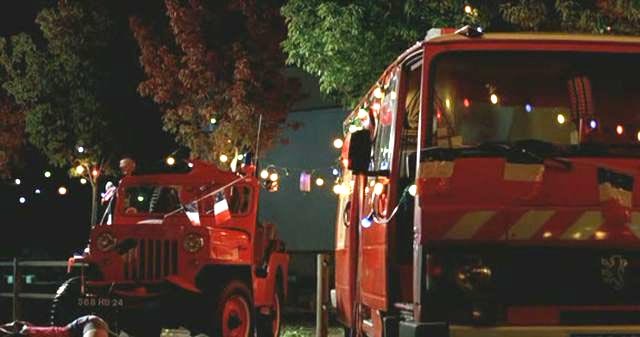 See lots more Mahindra police Jeeps in another 1995 film, Alluda Mazaaka. 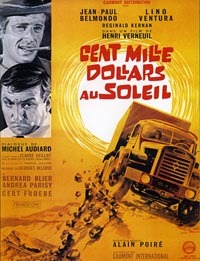 This French film, also known as Cent mille dollars au soleil ("100,00 Dollars in the Sun"), starred Jean-Paul Belmondo in a story about bandits and truck drivers in North Africa. This Jeep actually belongs to the Pompiers (fire department), not the police. 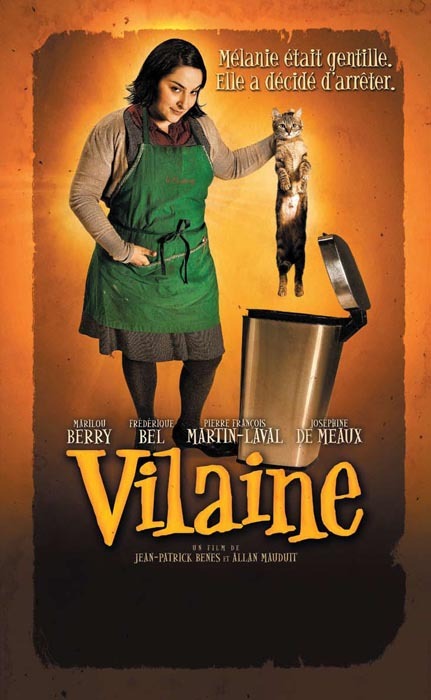 It appears briefly in the background of Vilaine , a forgettable 2008 French comedy about a homely girl named Melanie who works at a restaurant and gas station. She is taken for granted, and taken advantage of, by everybody, but finally gets fed up and turns "bad." The film is also known in English as Ugly Melanie . 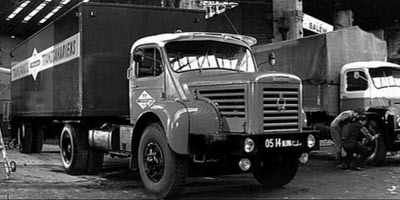 Another shot shows more of the Peugeot van, and at one point we also get a better look at the Reo tanker (40K JPEG) in the background. 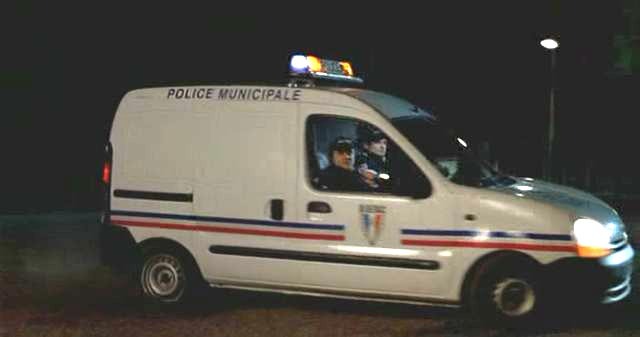 Meanwhile, the police have to make do with a Renault van (40K JPEG). See more high-hood cops in Bandit Queen and Ocean's 11 and Godzilla vs. Mothra. See also CJ-3B Police Jeeps in the Netherlands and Police Service Jeeps on CJ3B.info.